Green tea has been used for many centuries not only as an invigorating, healing drink, but also an effective tool for losing weight and maintaining the beauty and health of the body and face. Green tea perfectly quenches thirst, it acts as a tonic for the whole body, helps the body remove toxins and toxins, improves blood quality and heart function. Green tea cleanses the blood vessels and removes cholesterol from the body and helps to lose weight. As part of this healing drink, there are all necessary for our body's full-fledged work - vitamins and minerals and even protein. Green tea is full of antioxidants and that's why women who drink a lot of green tea so well look so long. If you want to lose weight without any diets, then just drink more green tea. The main advantage of green tea for ever losing weight is that green tea quickly and for a long time sates and you do not have to attack food if you just drink a cup of green tea. 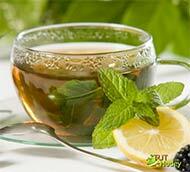 Diet on green tea - this is the most effective fast diet, which will help in 5 days to lose up to 4 kg of excess weight. The main principle of a diet on green tea is to drink at least two liters of green tea a day. 1. Start each morning of your diet with a cup of unsweetened green tea snack with fresh biscuits. 2. For the second breakfast, you must again drink green tea and you can eat a slice of black bread. 3. Lunch again start with a cup of green tea without sugar and finish with a plate of vegetable or chicken soup with black bread. 4. On a mid-morning snack again a cup of green tea and a serving of fruit salad with honey. 5. Dinner begins again with a cup of tea. For dinner, you can eat a piece of boiled fish or chicken breast and a servant of vegetable stew. If you really want to eat before going to bed, then you can afford a cup of low-fat yogurt or kefir, and it's best to drink a cup of green tea with a spoonful of honey. so you will not be hungry at night. On a diet on green tea you can sit no more than a week. Try to diversify the meager diet of the diet and replace the chicken breast with beef or shrimp, yoghurt for curdled milk or boiled egg. on a diet on green tea you can eat any fruits and vegetables, drink sour-milk products, but in small quantities. After a week of diet, you will feel light in the whole body and necessarily become slimmer.